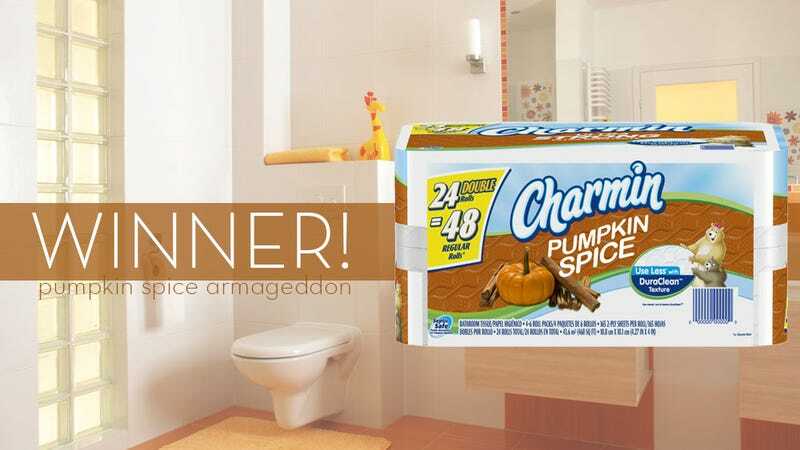 Kotaku' Shop Contest: Pumpkin Spice Armageddon: Winners! Last week’s ‘Shop Contest was a call-to-arms against the seasonal pumpkin spice craze. Our readers answered that call with both brutality and heavenly softness. The idea, stolen from every science fiction show ever, was that if we could not defeat the pumpkin spice-craving masses through normal means we would assault them with ridiculous products until they overload and explode. You want a combination of cinnamon, cloves, ginger and nutmeg? We’ll give you what you want, what you really, really want. And while some entries were more popular with the masses—the sick, demented masses—there was one entry that kept making me laugh every time I saw it. Congratulations on the win, Gene Jacket. You imagined a product that would forever leave people wondering if that really was just cinnamon on their fingertips. Without further ahhh...hee. Let’s do this. Kanzier666 — So tell me what you want, what you really, really want. ShiroNiKuma — for a completely original idea! MrDeadScott — for a completely original idea! SharedProphet — because does this smell like Chloroform to you? No! Gorillanator — because I threw up a little more. Gene Jacket for the win! Join us this weekend for a new Kotaku ‘Shop Contest, after I’ve recuperated from this one.